LA Times Article Proclaims Downtown Riverside Has "Blossomed Into a Fine Arts and Culture District"
1,000 Synchronized Swimmers Ready to Make Waves in Riverside! 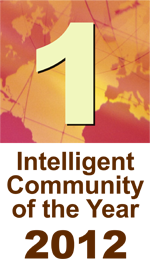 This week marks the end of Riverside's one year reign as the 2012 Intelligent Community of the Year. This prestigious international designation was bestowed by the Intelligent Community Forum (ICF) in a ceremony in New York City on June 8, 2012. Riverside was only the 3rd US City to win this award, and the first since New York City was honored in 2001. This week, a delegation led by Mayor Rusty Bailey will travel to New York City to culminate our reign, and the 2013 winner will be announced on Friday, June 7. As the hot spot for the region's trendiest new dining establishments, Downtown Riverside restaurants are getting a chance to showcase their favorite menu items later this month during Downtown Restaurant Week. The event is being coordinated by the Riverside Downtown Partnership and will run from June 20-30, 2013. Several local business service agencies, such as the SBDC and local Chambers of Commerce, offer valuable training opportunities on a variety of topics that help small business owners build or operate their businesses more effectively. However, if you are looking specific help on an issue or opportunity and need the information ASAP, you may want to check out the Small Business Learning Center.